Last year, I went along to a few improvisation classes in Brighton in search of some fun and a creativity boost, drop-in classes designed for all levels including novices like me. I love the silly games and the encouraging atmosphere – in improv, everything goes. After a couple of classes, I went along to one led by a different guy. From early on, it was clear he was upping the ante – for example, offering suggestions to improve our improv. Towards the end of the class, it’s usual to put some short scenes together and he set up what seemed a particularly complex scenario. To be honest, I felt a bit out of my depth, not helped by feeling particularly weary that day. I experienced an increasing sense of overwhelm and found myself shrinking into the corner, hoping it would all be over soon. It was as though my confidence had leaked away like air from a deflated balloon. How did it happen? It started in my head. Voices saying, “They’re funnier than you”, “What are you doing here?”, “You’re no good at this”. Instead of ignoring them, my tired self let them roam free. The natural next step was to second guess what other players were thinking about me from their facial expressions (I know, a recipe for disaster). Then my body followed suit as I tried to shrink myself away against the wall. 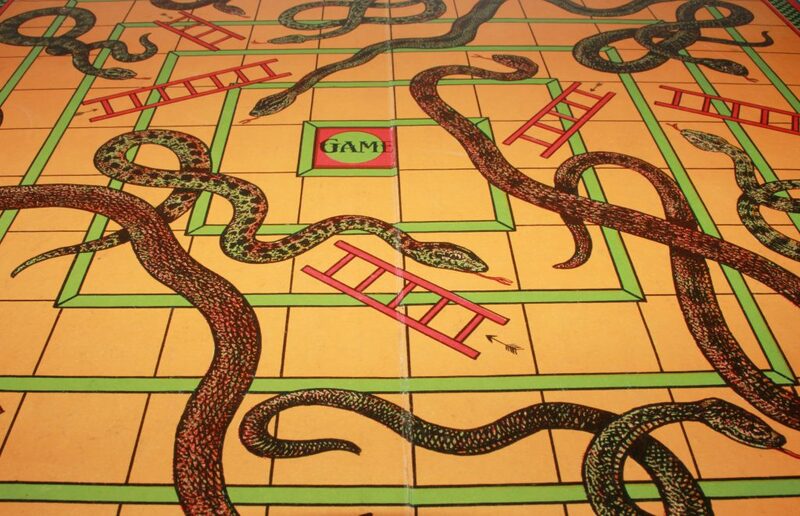 Essentially, a bit like landing on the top of a snake in the board game, Snakes and Ladders. Down I slithered. Clients often come to me saying they’ve lost confidence and I get it – it can feel like a piece of luggage we’ve left behind somewhere, perhaps handed in to a lost property office with an outside chance it may be reclaimed. What often happens, as in my case, is that we allow the negative voices in our head to have a field day (after all, they’re there to keep us safe and are keen to do their job properly, even if we’re not facing sabre-toothed tigers anymore) and then those thoughts activate our fear response and the way we hold our bodies (think hunched and small). In the improv story, whilst I was hoping to go unnoticed until the situation went away, the facilitator encouraged me to take my turn which, although uncomfortable, meant I got back in the saddle and actually managed to pull out some half-decent improv with the help of the other players (I seem to remember that, ironically, it involved an imaginary inflatable balloon hat). I was a bit fragile, but in the present moment again focussing on the matter in hand rather than in my head. The moral(s) of the story? Confidence is never lost – it’s just hiding. When you feel yourself start to slither down the snake, notice what’s changed. Negative thoughts? Tensed up or closed posture? Shallow breathing? There’s a ladder on the next square. As speaker and generally wise man Matt Church says : “Attention Out”. As soon as we start zoning in on and amplifying our own self-doubt, it’s time to take the focus off unhelpful thoughts, refocus on the world around us and how we can contribute. Take some deep breaths. Take your space. And start climbing the ladder. I’d love to hear your thoughts. Do drop me a line at alison@alisonreid.co.uk. Alison Reid is a leadership and career coach who helps professionals fulfil their potential and love their work, whether that's stepping up to a new role or making a career transition. She specialises in helping her clients find clarity, overcome self-doubt and cultivate confidence so they can feel great about themselves and their career. Alison is an accredited coach, keynote speaker and author of the white paper Cultivating confident leadership : A 3-step process to help leaders overcome fear and unleash their potential.